It took 1.5 hours to get a hitch out of town! Incredible. Longest time yet. Typically I’ve never had to wait for more than 10 minutes. I hit the streets around 7:30am with my thumb out. Soon after Nadine & Philippe walked past, telling me there was a junction further up that collects more traffic and was an easier spot to hitch from. They continued and I tried my luck until 8am, at which point, with no ride, I walked to the junction. Both were still there trying to get a ride. Rather than jump the line I sat off in the shade of a tree until they had a ride and then I’d go next. But that didn’t happen. We waited, and waited and waited. Lots of cars. 90% with sufficient room. 100% not interesting to carting trampers around. To be fair most were tourists and quite simply probably too caught up in getting out of Dodge and onto their next venue. After an hour, still no ride for the Swiss couple. Then along come another group of 4 trampers, then another 2 and then 2 individual trampers in quick succession. All heading for the same place. All trying to hitch near abouts from the same spot. Everyone is on the run towards the end. We spread ourselves out along the road a bit. After about 1.5 hrs an Irish guy finally pulls up for Nadine & Philipe. They know I’ve been patiently waiting and ask the guy if he had room for one more. He does. They call over to me and I jump in. I have a ride out of town. Awesome. It was a solid day and much tougher than I expected both physically and mentally. 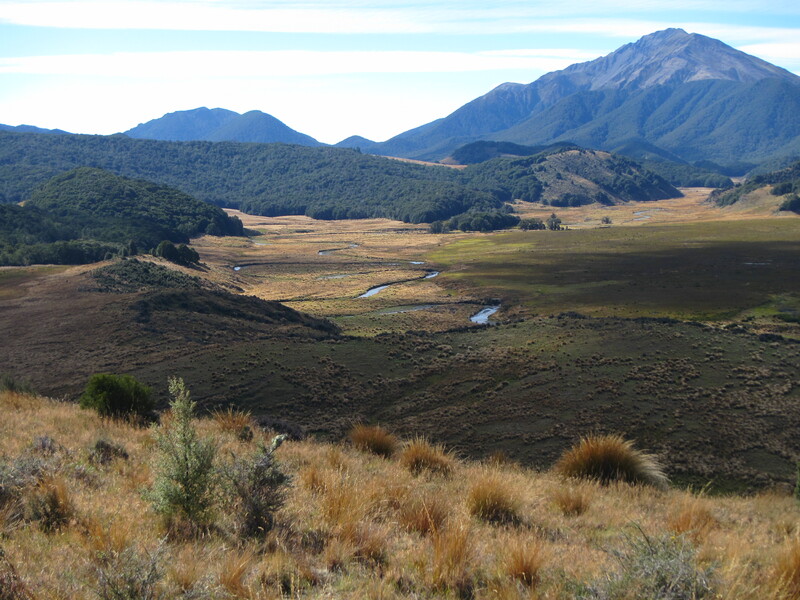 For the past week or so most of the tramping had been in relatively flat valleys with the odd hill. 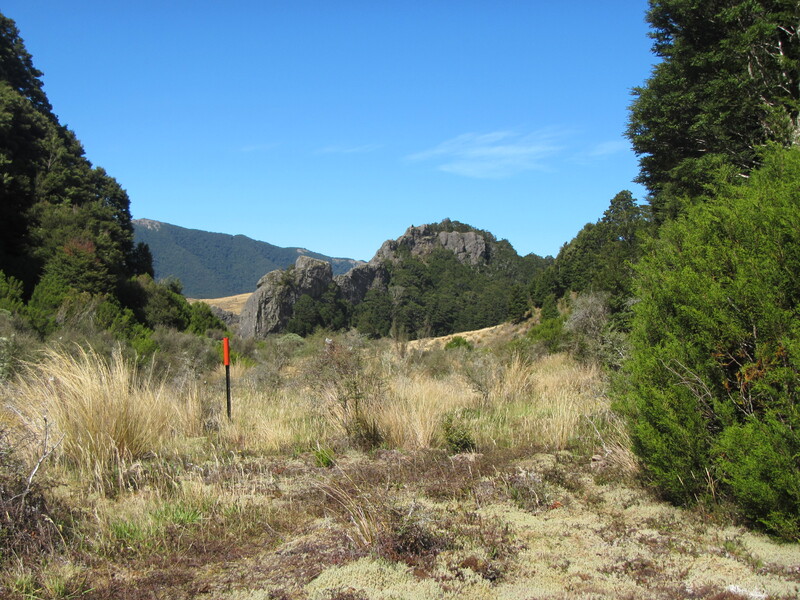 As we took to the Takitimu Forest it was back into thick Beech Forest, sidle tracks and crazy tussock. Our ride got us to the junction of Princhester Road and Hwy 94 at around 10:30am. A late start but at least we got there. The others hitching out of town would arrive much later. The first 6 km of the day were on a farm track and quick. Not particularly inspiring but it was great to get started knowing this was the beginning of the final leg of this massive journey. Nadine and Philippe are quicker walkers and Intoldvthem to go ahead. My last resupply loaded up, the pack was heavy but I wasn’t complaining. I had views to the forest ahead that we would have to tackle and was kept entertained for a bit by the incredible flying skills of a chopper spraying some paddocks a way off. I had a quick stop at Lower Princehester Hut just catching Nadine and Philippe as they headed off into the forest to start the Takitimu’s. I followed shortly after. I wasn’t quite sure what to expect from this forest. I found it hard and challenging. It was great to be back in the forest but the track quickly became rooty and climbed for around 3 kilometres. Sections were sidled and the vegetation thick, covering the edge of the track and several hidden holes and slippery mud sections. My feet found several of those slippery spots and I had one hard fall, sliding off the track, my legs and hands hitting the deck to scrap against the ground and add to the collection of bruises, scrapes and cuts. There was a short section with a steep ascent as well. It was only short but I was struggling. I think my mind had switched gears and was looking towards the end of Te Araroa. For some reason I thought the final days would be easy given some of the crazy terrain already travelled and the fitness that I’d developed over the last 4 months. Boy was I in for a surprise. The trail soon climbed to a saddle where I found Nadine and Philippe enjoying lunch. It was a bit early for me so I pressed on for another half hour, finding a nice lunch stop on the descent from the saddle. Leaving the bulk of the forest behind the next section ran through a series of open tussock patches, diving in and out of the forest and back into long open stretches of some of the hardest tussock I’ve encountered so far on this trip. Don’t think I’ve stumbled, fallen and tripped as much on any section of Te Araroa as much as the tussock sections of this leg towards Aparima Hut. Thrown in for good measure there were numerous bog, peat and moss sections. All soaking wet and difficult to negotiate. One particular section was several hundred metres of pure sponge, the ground moving 5cm or so with each step. At around 4:30pm I was done for the day. Only 22 km travelled but I wasn’t going any further. Judging from what I’d just walked through I didn’t like the chances of finding a suitable camp site beyond Aparima Hut, as the ground would either be wet, tussocky or a jungle under the beech. I was not going to try to push on for another 12 km to the next hut either. Completely covered in mud up to my the knees I badly needed a good scrub down. That was me done for the day. Mary-Kate and James were at the hut and decided to press on. At around 5pm Nadine and Philippe arrived at the hut and pressed on as well. That was all good. While we all carry tents, its nice to sleep in a hut and Aparima Hut could bunk 8 people. There still plenty more trampers to come through today. Theres an older memorial hut at Aparima that can sleep 3 as well but its a bit more run down. While I had the place to myself I had a wash and spread my gear out to dry in the sun. At around 6pm the first of a big crew of trampers started coming through. First to arrive was Rune from Denmark. We had instant rapport. On introducing himself as Rune I was super excited. “You’re Rune!. Great to finally catch up and meet up. I’ve been following you guys through the hut books for weeks.”. I had been literally been following a group of trampers for weeks through the hut books, only ever a few days ahead but I could never catch them. Where ever they were, hut book comments suggested fun shared the trail with them. To me, they were the party crew. I knew that they had been travelling with POD and Disco plus Solenne and Antoine for sections as well and they would all possibly arrive at Aparima tonight. I haven’t seen POD and Disco since parting company at Ships Cove, a whole island ago. It was exciting to know that I was likely to be finishing Te Araroa with trampers I knew and had met early in the game with the addition of an awesome new bunch of friends. One by one they arrived. Mat and Bella from the UK; Tom from the US; POD and Disco; and Celistino from Germany in tow. Nice. We spent the evening catching up, sharing tales and enjoying the company. Right around 9pm, just as there was no more sun light, Solenne & Antoine arrived as well. Having to wait 2.5 hours for a hitch out of town they had a late start and walked the whole distance with no breaks to make the hut before all light faded. A super effort indeed and a reunion of sorts for the crew of 8 plus Celistino and myself, coming together for the final stretches towards Bluff.